We are celebrating further successes in the 2018 Green Apple Awards. The award organisers, The Green Organisation, have just released the 2018 finalists which confirm AJC Trailers status as a winner in this highly sort after accolade. 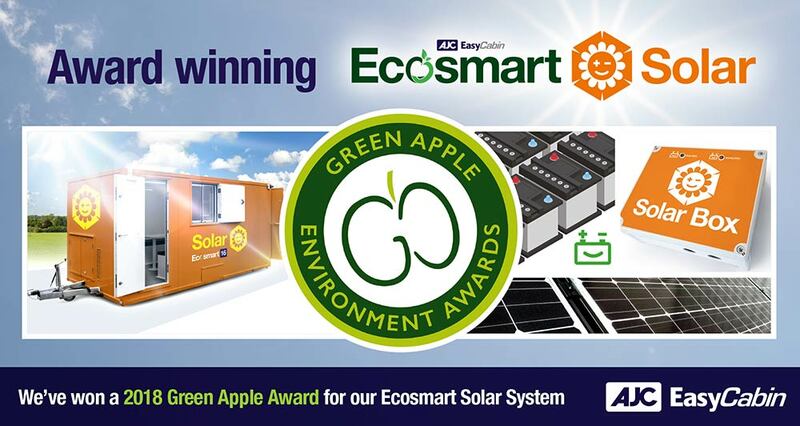 The company has been nominated in the Green Apple Award for Environmental Best Practice 2018 category for their Ecosmart Solar welfare product. This brand new product is designed to help to protect the environment using sustainable energy. EcoSmart Solar technology improves energy efficiency, reduces emissions and limits generator operation. An operator of an AJC EasyCabin unit fitted with an EcoSmart Solar will benefit from an estimated 93% increase in energy efficiency when compared to a continually running 6.0kVA generator. The set-up has fully automatic operation, guaranteeing all essential services; i.e. hot water, lighting is always available. AJC Trailers were previously honoured in both the UK and World the 2017 Green Apple Environment Awards for their creativity in the design and manufacture of energy saving devices used in their temporary accommodation products. In 2018, AJC Trailers competed against more than 500 other nominations and they will be presented with their trophy and certificate at a glittering presentation ceremony on 12th November. The Green Apple Awards began in 1994 and have become established as the country’s major recognition for environmental endeavour among companies, councils, communities and countries. The Green Organisation is an international, independent, non-political, non-profit environment group dedicated to recognising, rewarding and promoting environmental best practice around the world.